- COMPLETE STARTER KIT FOR EVERY HOME - Features a loud 120dB alarm unit (siren), 4 window & door sensors and two remote controls. No wiring required because the system components connect wirelessly to one another and are battery operated. - SIMPLE - Simple installation and easy to use. Installation in a couple of minutes. Remote controlled operation, activate and deactivate the system even from outside your home. Solid user manual provided. 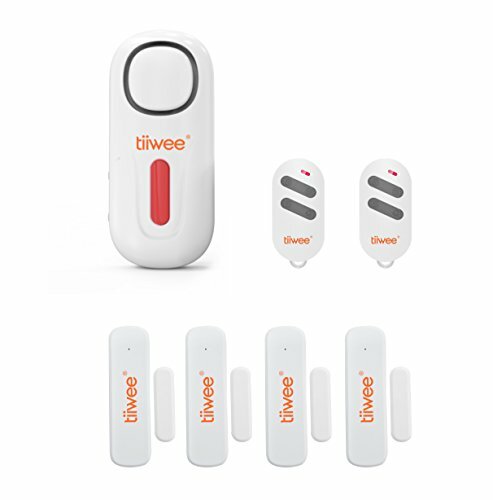 - EXPANDABLE - Expand the Kit with further Tiiwee Home Alarm System accessories. Add more door & window sensors, movement detectors, alarm (siren) units or remote controls. Up to 40 sensors can be added to each alarm unit. - VERSATILE - The alarm unit is small but very loud. This enables you to either give it a fixed position or to take it with you when you need it somewhere else, somewhere where they are needed and should be heard. Features both alarm (loud siren) and chime mode. If the siren alarm is triggered, the siren will automatically stop after 2 minutes and the system will revert to activated mode. The siren can also be stopped by using the remote control. - TIIWEE SERVICE AND QUALITY - 30 Day guarantee. Just return the product and you will be reimbursed, no questions asked. Questions or requests? We respond fast and always in your interest. Note that this website may be compensated for linking to other sites or for sales of products we link to. This is necessary to pay things such as hosting and design costs.